Assert your sartorial chops by teaming a black blazer and blue skinny jeans for a casual getup. 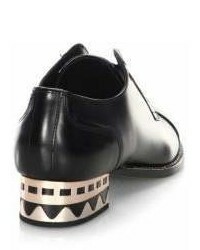 Take an otherwise mostly casual outfit down a dressier path by finishing with Sophia Webster black leather oxford shoes. 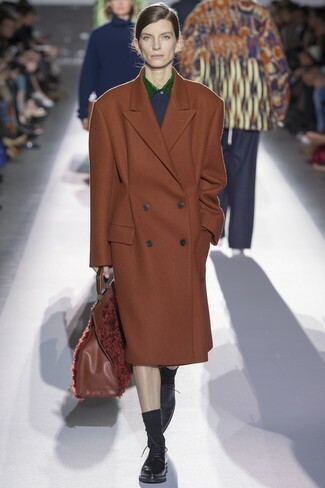 Wear a brown coat for an absolutely stylish outfit. Sophia Webster Riko Leather Oxfords pull the getup together. This look with a black crew-neck sweater and hot pink capri pants isn't a hard one to pull off and is open to more sartorial experimentation. Want to go all out when it comes to footwear? 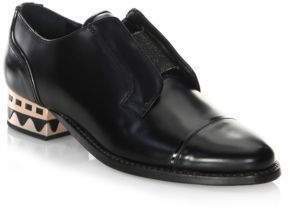 Introduce a pair of black leather oxford shoes to the equation. This relaxed combination of an orange coat and a black embroidered casual dress is extremely easy to pull together in next to no time, helping you look chic and ready for anything without spending too much time combing through your wardrobe. 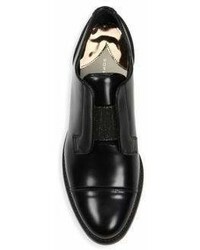 A pair of black leather oxford shoes will take an otherwise utilitarian ensemble a whole other path. If you feel more confident in comfy clothes, you'll love this incredibly stylish combo of a light blue denim jacket and a black pleated leather midi skirt. Finishing off with Sophia Webster Riko Leather Oxfords from Saks Fifth Avenue is a surefire way to add an extra dimension to your getup. On days when comfort is crucial, this combination of a black coat and blue ripped skinny jeans is a winner. If you feel like dialing it up a bit now, complement this ensemble with black leather oxford shoes. This combination of a black blazer and grey dress pants is very easy to throw together without a second thought, helping you look cute and prepared for anything without spending too much time rummaging through your wardrobe. Introduce a pair of Sophia Webster black leather oxford shoes to the equation and ta-da: this outfit is complete. This combo of a grey horizontal striped tweed jacket and white and black houndstooth skinny pants is perfect when you want to feel confident in your look. 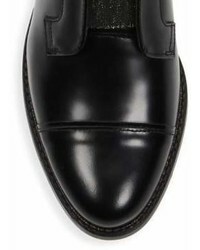 Black leather oxford shoes will breathe an added dose of elegance into an otherwise utilitarian look. This laid-back pairing of a black v-neck sweater and black and white gingham skinny pants is a fail-safe option when you need to look cool in a flash. Let your styling credentials truly shine by completing your outfit with a pair of Sophia Webster Riko Leather Oxfords.